Nottingham Forest have completed the loan signing of Birmingham City striker Gary McSheffrey. The 26-year-old joins the Reds for an initial 29-day period and is available for Saturday's game against Swansea. Boss Billy Davies said he was looking forward to working with McSheffrey, whose loan spell could be extended. "He's a player I've admired for several years. He's a major threat both as a creator and scorer of goals," Davies told the club's official website. "It's a fresh challenge and I'm sure he will be a great acquisition for us." Forest have the option to keep McSheffrey at the City Ground for longer than the initial 29-day stay if the deal works out. However Birmingham will then have the right to recall the player if they want to. 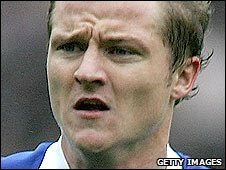 McSheffrey, 26, joined the Blues for £4m from Coventry in 2006 but has fallen out of favour at St Andrew's.